Dr Louis Creed (Jason Clarke), his wife Rachel (Amy Seimetz) and their two children move from Boston to rural Maine in the hope of finding a quieter, more easy-going lifestyle. When they find a century-old pet cemetary near the back of their property, it seems a creepy but charming oddity. When tragedy strikes – and Louis receives some unexpected help from his elderly neighbour Jud Crandall (John Lithgow) – the cemetary’s frightening legacy becomes clear. 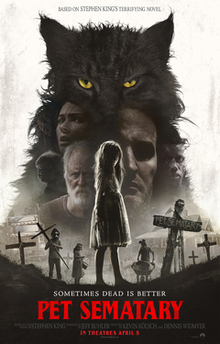 Pet Sematary, directed by Kevin Kolsch and Dennis Widmyer, adapts the popular novel by Stephen King. King has proved lucrative story fodder for Hollywood for decades now; Pet Sematary itself was already adapted for film back in 1989 in a reasonable effective version directed by Mary Lambert. While the King adaptations never stopped completely, they did slow down somewhat in recent years. The huge box office success of It back in 2017 pretty much guaranteed that Hollywood was going to start digging into that back catalogue again, and of his more famous works Pet Sematary was a shoe-in for a fresh adaptation. 30 years on, how does Kolsch and Widmyer’s version fare? The most important thing to note is that Pet Sematary is a stylish and overall very effective horror film. I suspect that is particularly true for any viewer coming to the film entirely fresh, having neither read the original novel or watched the Lambert’s version. There is some excellent visual imagery here, both in terms of the overall aesthetic and in Laurie Rose’s strong cinematography. The overall quality of Hollywood horror cinema has been on the rise for several years now, and Pet Sematary does not let its genre down. The cast feels particularly strong. As protagonist Louis Creed, Jason Clarke delivers a subtle and measured performance – particular during the film’s second half when circumstances change and Creed turns to desperation. Clarke is to my mind an underrated actor. The realism he brings to the film only enhances it. Amy Seimetz is given a more difficult character to play as Rachel Creed, and while Seimetz herself does an effective job she is let down slightly by a muddled and overly busy screenplay. This strangely cluttered narrative affects the film throughout it’s first half, before streamlining and growing more effective in the second. By far the best performance of the film belongs to John Lithgow as Jud. He plays the role with multiple layers of charm, fear, and regret. Lithgow is almost always sensational on screen, but he works particularly well here. He adds tremendous depth. The film takes a surprising turn at its midpoint, and starts to move in a different direction to both the novel and the original film. It is mostly smart choices that are made, taking something that was difficult to present convincingly on screen the first time around, and replacing it with an alternative that provides better characterisation and which takes good advantage of talented juvenile actor Jeté Laurence. Some King fans may bristle at the changes made: for me they were to the film’s overwhelming advantage. The only real sticking point for me, and it feels like a slightly unfair complaint to make, is that Kolsch and Widmyer have an odd tendency to promise an even better film than they ultimately present. An eerie early sequence involving local children burying a dead pet is packed with unsettling imagery, but then that imagery is only barely followed upon. A later sequence involves Jud showing off frightening illustrations in a book, ones that imply the film is going to get genuinely monstrous by the climax, but no such monsters appear. It creates the weird, unwanted effect of being both entertained and disappointed at the same time. All up, however, this is a horror film that works.